Goats eat almost anything, thrive with little maintenance, and produce nutrient-dense milk. 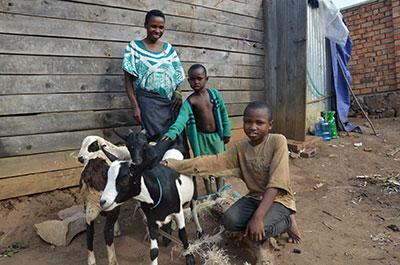 A goat provides a family with nutrition as well as produce to sell as their herd grows. “This is the day God has made for us to rejoice! I’m dancing because I have seen God through this charity. I will have manure to grow vegetables to feed well my family and sell some to gain money to buy other things. My children also are very happy to have the goat in our family,” Mary said.